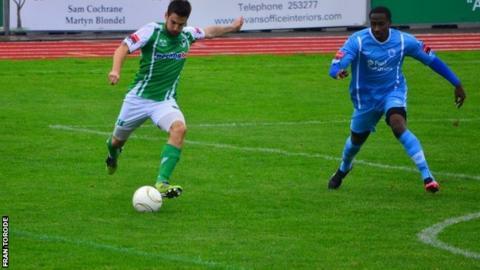 Guernsey FC boss Tony Vance hailed striker Ross Allen as "phenomenal" after the prolific forward scored a brace on his 100th start for the club. Allen, 26, has scored 137 goals for the club, with 24 in 19 games this season. The Green Lions were held to a 3-3 draw by bottom side Eastbourne Town to leave them in fifth place in the table. "The fact he's made 100 appearances is absolutely fantastic and shows the commitment he's got to this club," Vance told BBC Guernsey. "And his goals are just phenomenal. It was very easy to put him back in and he had two great finishes but it was not enough for us on the day." Allen has averaged more than a goal a game for Guernsey for the last three seasons in a row, and he is currently third in the Ryman League South goalscoring charts with 14 league goals so far this campaign. Vance said the loss of Dom Heaume and Angus McKay to injury had not helped his side's chances against Eastbourne, but admitted his players should have secured all three points. "At half-time we got ourselves into a 3-1 lead and then we lost two of our most influential players, obviously we could have done with them second half," he said. "But it's no excuse - we were 3-1 up and didn't shut them out and in the end we were probably lucky to get a draw."